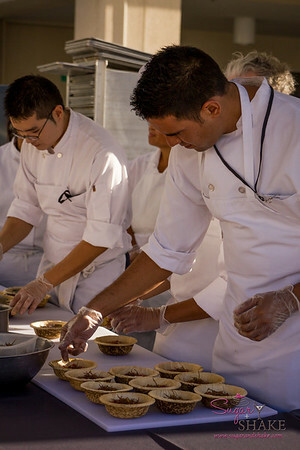 Hawai‘i Food & Wine’s Saturday event placed an emphasis on local, sustainable ingredients. (Actually, all the events used a significant number of local products and the event organizers did a fabulous job of recognizing all the local producers on the signage.) 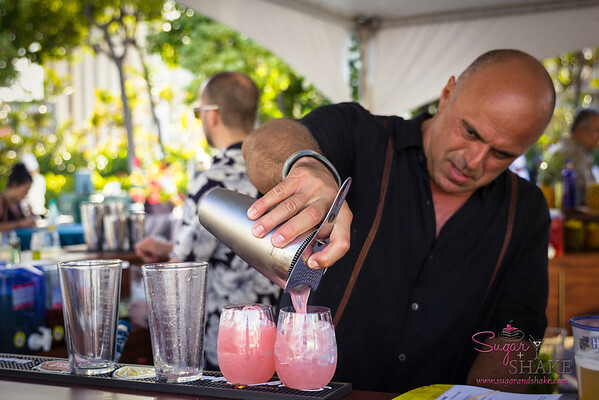 There were 18 chefs participating, plus five mixologists, and I was super bummed that I couldn’t try everything—we missed several dishes that looked so good! Here are a few favorite shots. For the rest, click over to the gallery. 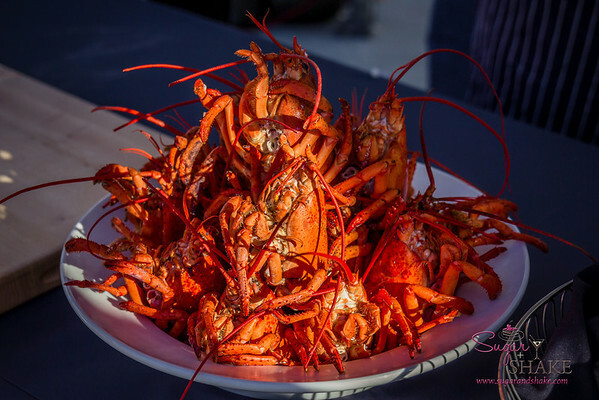 (By the way, we didn’t eat all of this—because we got in ahead of the crowd, I had a chance to photograph a lot of dishes in some lovely light as they were being plated up.) I had a lot of fun taking these, so this will be a longer post than the last one. 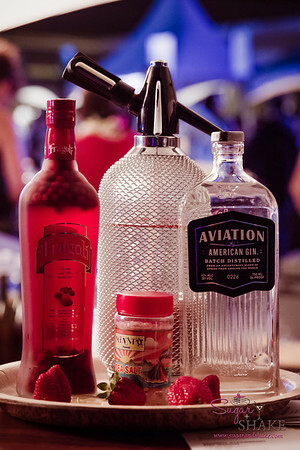 Usually I start off with the cocktails, but this was a FOOD festival, so I’ll give the chefs and food top billing this time around. 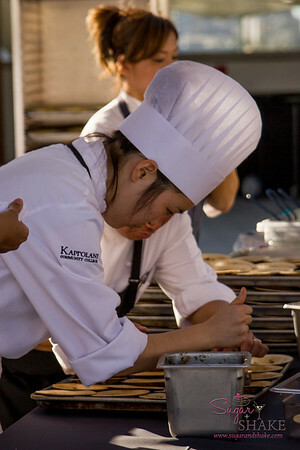 Because we had VIP admission, we got to enter an hour early, which was great for taking some fun shots of the chefs and their Kapi‘olani Community College culinary student assistants prepping. 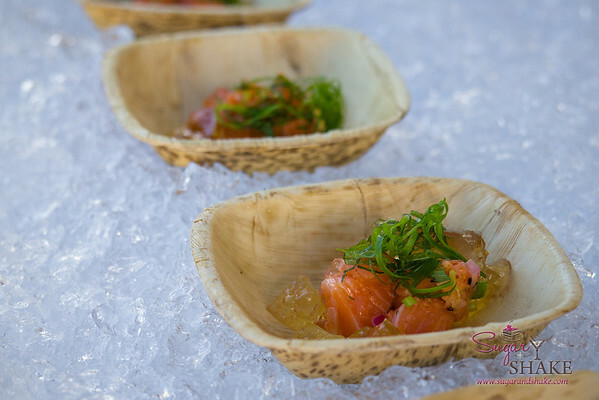 Chef Sang Yoon (Lukshon)’s “Modern Lomi Lomi Salmon” with tomato water gelée and pickled Maui onion. The gelée was the best part of this. 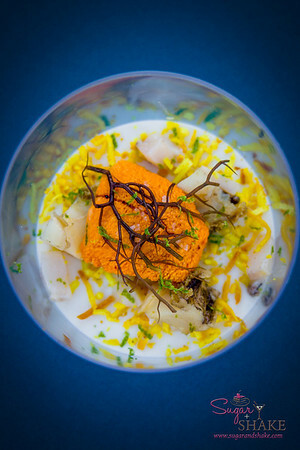 Chef Mourad Lahlou (Aziza)’s nice and briny Coconut Panna Cotta with vadouvan, crab and uni. Such a pretty little sea garden! 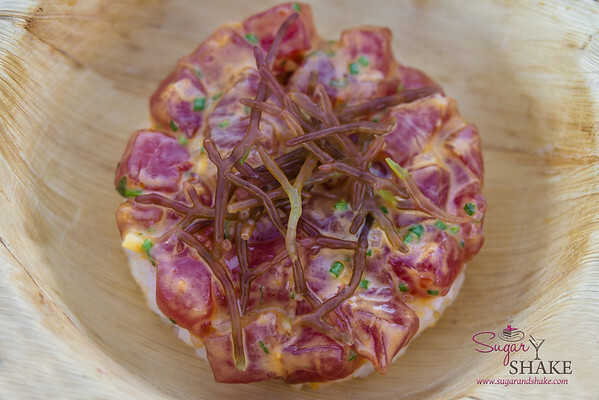 Chef Jon Matsubara (Japengo)’s Smoked Kona Lobster with preserved dragon fruit, cinnamon leaf, wasabi oil and ‘ulu brandade went super-fast. 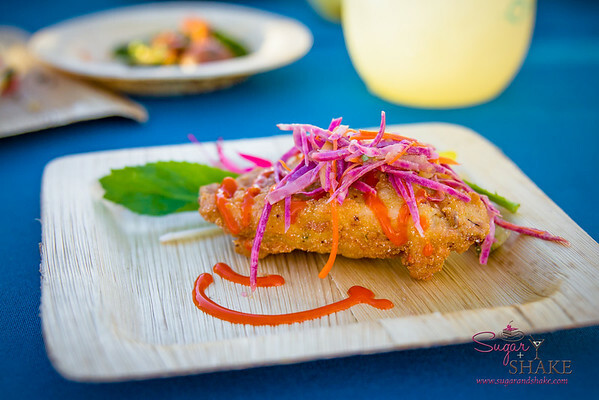 This one was probably my favorite dish of the night: Chef Art Smith (Table fifty-two)’s Southern Fried Hawaiian Fresh Catch with sweet potato slaw, yuzu vinaigrette and mango hot sauce. It was quite an inventive use of the purple sweet potatoes. I’m not saying I ate them (both sweet potatoes and slaw are on my list of foods I have an irrational dislike for); I’m saying it was a cool presentation. Dessert!!!! 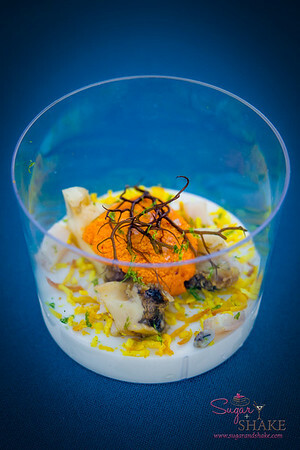 I love Halekulani pastry chef Mark Freischmidt (Halekulani)’s creations. He was behind my super-awesome birthday cake earlier this year. 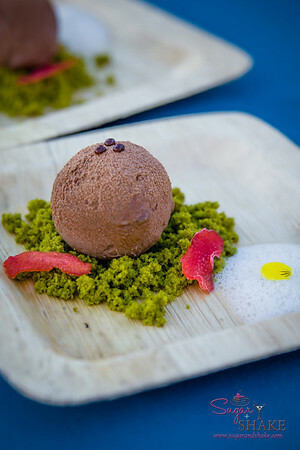 This is his “Coconut” with matcha mint sponge, ohi‘a lehua honey and rhubarb (I had two of these…or maybe it was three…) and bonus extra, chocolate-enrobed pineapple chunks. The “Coconut” had an oozy center—kind of like a Cadbury Egg…but, like, way awesomer. 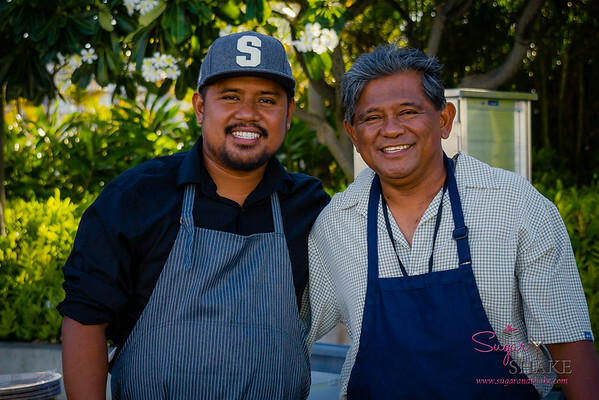 Our friend Chef Sheldon Simeon brought his dad, Renoir, with him to help with his dish: Big Island Goat Kilawen. 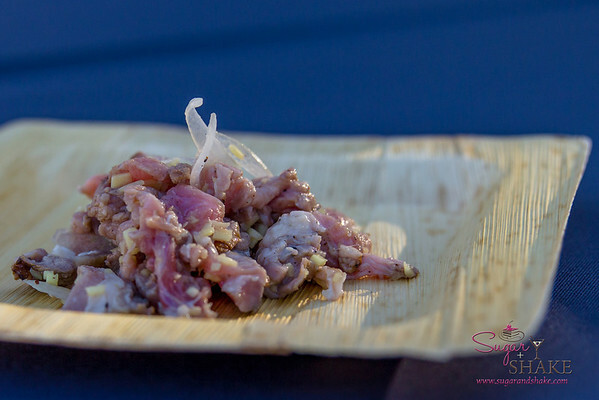 Kilawen is a Filipino dish, sort of a meat ceviche; this version Sheldon and his dad made was goat, lightly seared on the grill. 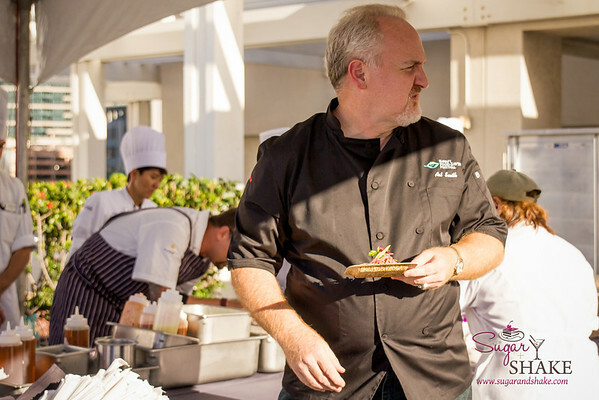 Of course, Chef Mark “Gooch” Noguchi (The Pili Group/Taste Table) is always the ultimate in locally sourced product. 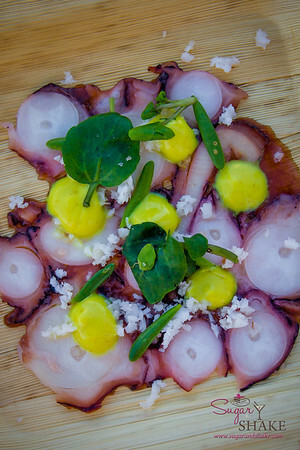 This (left) is his Kāne‘ohe He‘e (Octopus) with coconut, olena (turmeric), ‘ākulikuli (sea purslane) and hand-harvested pa‘akai (sea salt). 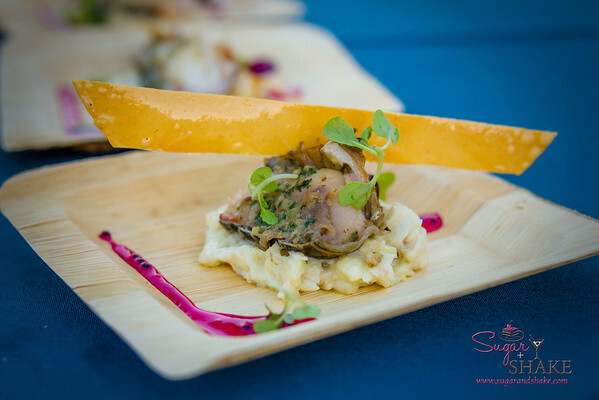 It was very fortunate that this dish had this flat plating because I took a turn to forage for our group of three and was a total disaster—the wind kicked up and one of my plates went flying! Fortunately, all those paper-thin pieces of tako stayed stuck to the plate and a very nice gentleman came over to help me carry my errant plates to the table. This is obviously why I am a better table guard than forager. 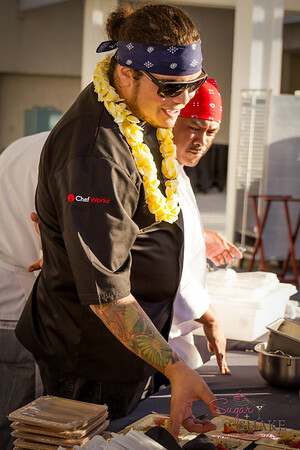 On the right is Chef Ed Kenney (town)’s Grilled Pa‘i‘ai & Kukui Nut Broth. 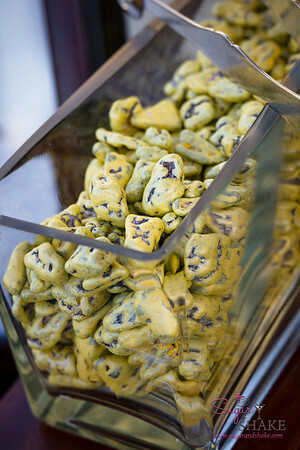 I’ll be honest, normally I don’t like pa‘i‘ai at all, for the same reason I’m not a big fan of the mochi in ozoni—too gloopy and chewy. But I would totally have a couple more helpings of this one. 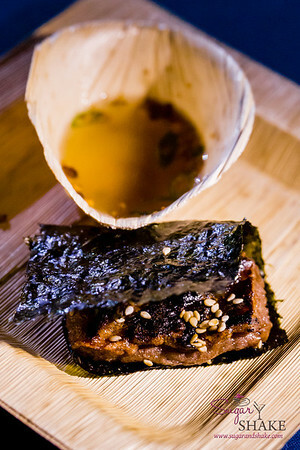 It was glazed with a salty sauce, grilled and wrapped up in a piece of nori—basically, it tasted a lot like kakimochi. Shake and our friend felt that the sauce was unnecessary, that “pa‘i‘ai is awesome on its own!” Sorry, my dear husband, but you are wrong. For folks like me who must be tricked into eating your glutinous taro, this sauce was perfection. 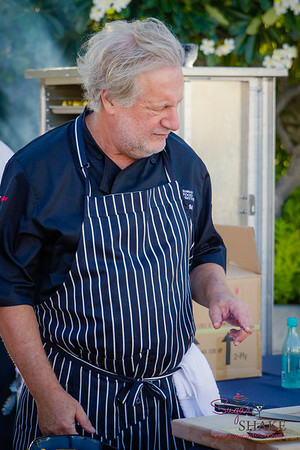 That’s Jim Meehan of PDT behind Tony’s elbow. I knew I’d seen him setting up while I was going around shooting early, but when I told Shake, Jim had disappeared from the cocktail kiosk. So, mistakenly thinking he wasn’t participating in the evening’s event, we ended up not getting to try either of his offerings. By the time I went back around the far side of the drink station again and spotted Jim, he was all out, too. 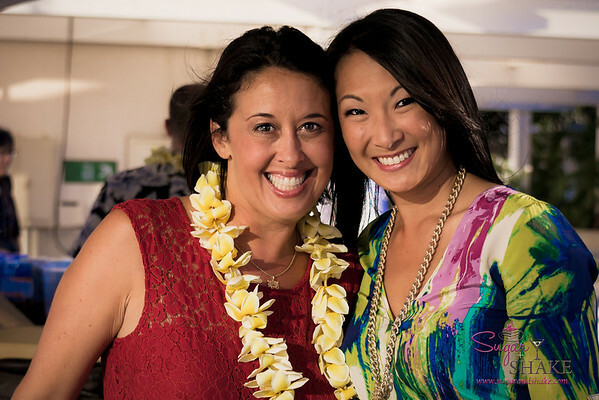 My favorite ladies of the cocktail world: Julie Reiner (Clover Club) and Chandra Lam Lucariello (Southern Wine & Spirits). We happened to try Tony and Julie’s drinks early-on, which turned out to be quite fortuitous—Tony’s Monkey Shine and Julie’s Upcountry Buck (rum, lime, pineapple, ginger, soda; pictured, below left) and Holiday in Jalisco (tequila, jalapeño, lime, pineapple) were very bright, with lots of fruit acid—perfect for the late afternoon heat. Shake went off to Francesco Lafranconi’s station and came back. He handed me a drink, “Here, this one’s you all over.” Yep! 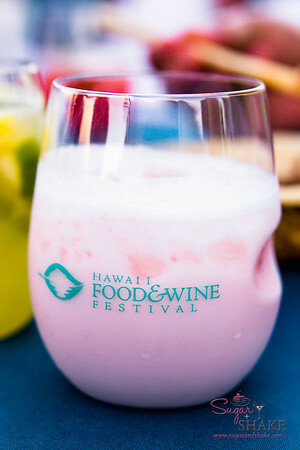 Francesco made dessert: a Coconut Strawberry Fizz (gin, Fragolí liqueur, cream, sweet ‘n’ sour, egg white, orange flower water, coconut cream soda). I went back for another. 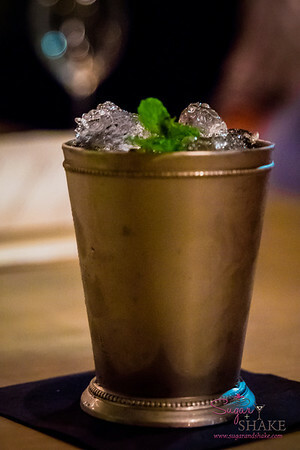 Daniel Anthony Lucariello (Aulani) made the drink I kept going back for, a drink I NEVER would have thought I would like. 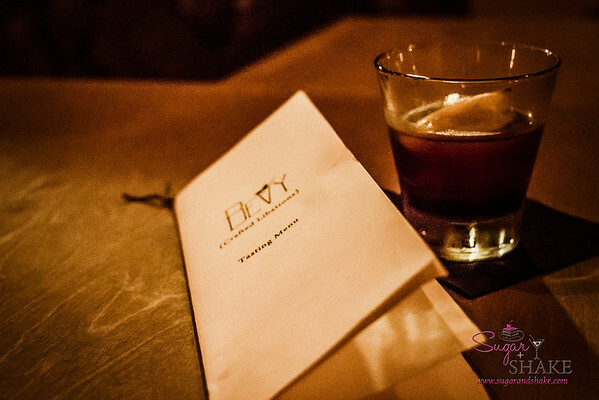 His Espadin Rose was a riff on a Negroni, a drink I love. What I normally don’t love? 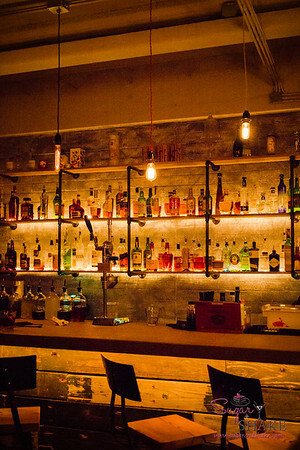 Mezcal. 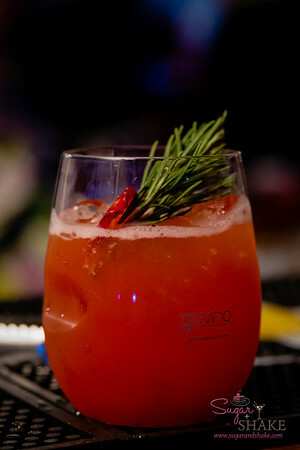 Danny used a strawberry-infused mezcal, Aperol and the Cocchi Vermouth di Torino that we had in the “Sweet Endings” class. 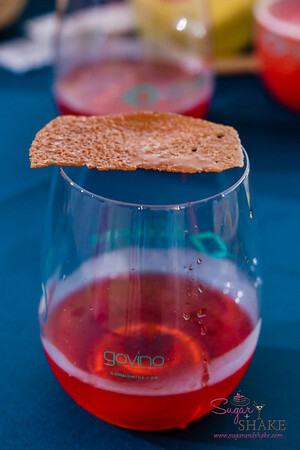 On top of the glass, Danny torched a piece of orange tuile candy. 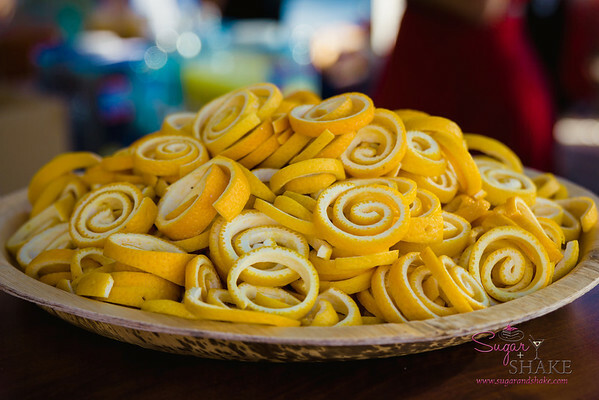 The whole thing was lightly sweet and nicely bitter. I was in love. You would think that after all this food and drink we would be sensible, go home and hibernate like fat bears. But I go to the farmers’ market in 3” heels. I don’t do sensible. 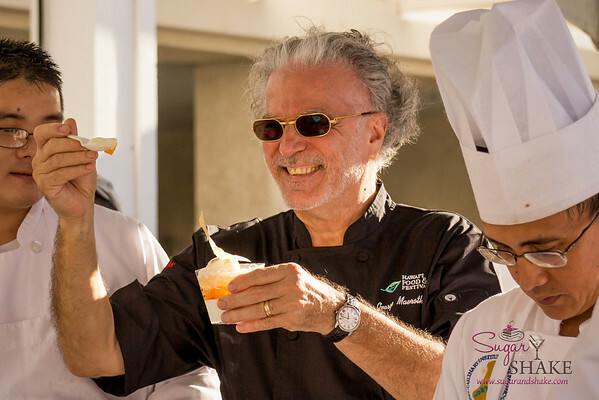 There’s still one more HFWF event recap to go…coming soon! 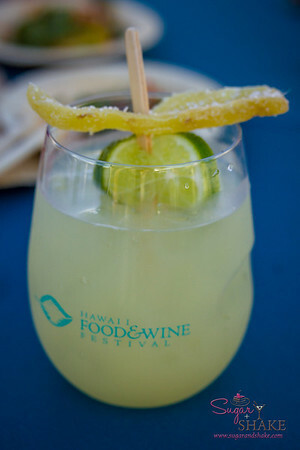 Disclosure: Access to events was provided by the Hawai‘i Food & Wine Festival, but no compensation was received for this post, and the opinions expressed are strictly my own.